Welcome! Thank you for visiting UbounceInc.com, where you'll find all the best inflatable attractions like Combo Bouncer Rentals, water slide rentals, and the best deals in Kentucky! With our new online reservations system you'll can browse all awesome attractions and equipment we have to offer and build your party or event as you go. You can see all our popular inflatable rentals such as inflatable dry slide rentals, along with extreme obstacle course rentals, interactive game rentals, dunk tank rentals, and concession machine rentals. Cotton Candy machine rentals and Sno-Kone machine rentals are both a great addition with any inflatable rental. As always, deliveries in Harrodsburg and all of Mercer County are free. That's right, free delivery! Some of the great places we have delivered to in Mercer County are: Anderson Dean Park, Young Park, Fort Harrod Park, Mercer County Schools, Main St., Devine's Corn Maze, Salvisa Baptist Church, Harrodsburg Christian Church, several other Mercer County churches, Burgin Fire Hall and the Mercer County Fair Grounds for Kentucky's Fort Harrod Beef Festival to name a few. We accommodate for indoor or outdoor events. U Bounce Inc. is family owned local business in Harrodsburg, Kentucky. As a family owned business, U Bounce Inc. takes pride in our clean party rentals and takes our guests safety as a top priority. 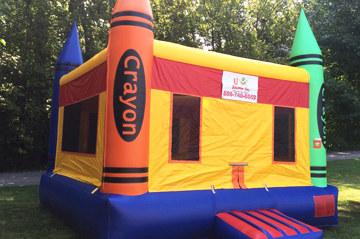 Whether you are planning a birthday party, church function, block party, large corporate picnic, you can be sure U Bounce Inc. will be punctual with clean and safe party rental items. Clean and santized, GUARANTEED! U Bounce Inc. Inflatables & Party Rentals is licensed and inspected by the state of Kentucky. We bring the fun and you make the memories! Start your party experience today and get ready for the best events around! Get Your Party Jumpin' with U Bounce Inc.! Building you party is easy at UbounceInc.com, with our convenient 24/7 online reservations system. 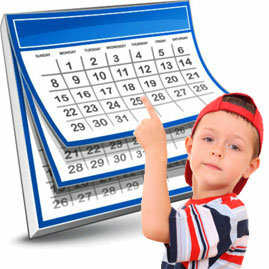 Just click the link below and enter the date and times of your event. Then as you browse through the website you will be presented with only those items available for rent, on your date. That takes all the worry about whether or not your favorite items are available. Not ready to commit just yet? No problem! You can also just explore all the categories and as you see items that are perfect for your indoor or outdoor party, just click the "Add to Cart" button on every product page, and build your party that way. Then you can continue shopping or view your cart and check out. That's all. It's easy as one, two, three! Start planning your event today. The classic bounce house is a favorite American inflatable attraction. Our Harrodsburg customers love to turn a good event into an awesome party with one of our inflatable bouncy castle rentals. Bouncers are fun for kids of all ages, and you might even catch an adult or two in some! Your party goers with have a blast laughing, bouncing, and playing in our safe and clean inflatable bouncy castles. Rent one of these exciting bounce houses for your next event today! Pump up the excitement with a Bounce House Combo Bouncer! Pop ups, slides, basketball hoop, climbing and jumping areas are some fun features to keep any children's party exciting. 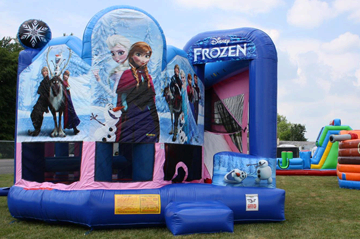 Featuring themed combo bounce houses with all the characters from "Frozen" or the "Justice League" to help make your event that much more special. Combo Bouncers are great choice for your event in Harrodsburg, Kentucky! 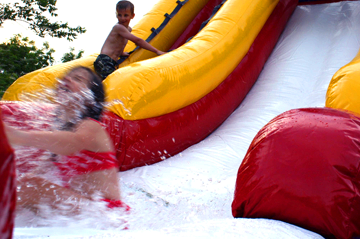 Put the splash in your summer with an inflatable water slide rental! Choose from small water slides with splash areas, which are great for smaller children. Or choose a huge water slide with slip n slide and a pool attached, great for adults that just want to have fun! Slip N Slides are always a great way to cool off on those hot, summer Kentucky days also. During the not so hot months, or indoor events U Bounce Inc. has awesome dry slides that will keep your party packed with hours of fun! We deliver on time to Harrodsburg, set up, clean, sanitize and pick up all our rentals. Fundraising has never been more fun in Harrodsburg! Dunk Tanks are a great tool for fundraising or other promotional opportunities where a little splash of the boss, principle, coworker or friend can be amazingly entertaining. U Bounce Inc. has the best, and we are ready for you! Dunking Booths are a great complement to street carnivals, corporate events, back yard parties, church functions and don't forget school festivities too! Our local schools rent inflatables from U Bounce for special events. The inflatables are fun for kids and adults. The staff is friendly and safety conscious. I've been to other charitable fundraiser events who have rented from U Bounce, as this company is the most reliable and responsible family/community-friendly business. These were the best people I have ever worked with planning a event! Super kind, and efficient to get everything that we needed to make our event runs so smooth. Very thankful for the professionalism and excellent service! Friendly service, very affordable and easy to work with! Thank You For Choosing U Bounce Inc.!